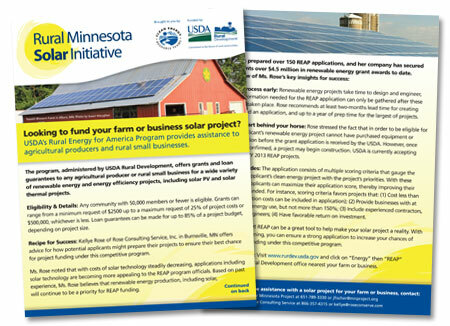 Looking to fund your farm or business solar project? USDA can help! Grants can range from a minimum request of $2500 up to a maximum request of 25% of project costs or $500,000, whichever is less. Loan guarantees can cover up to 75% of total eligible project cost. 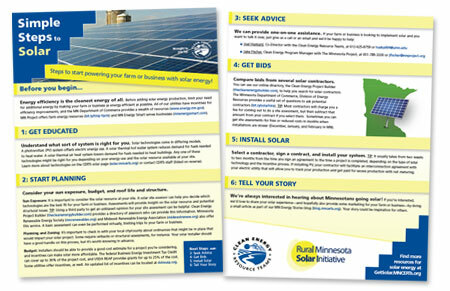 The Rural Minnesota Solar Initiative recently spoke with Kellye Rose of Rose Consulting Service, Inc. in Burnsville, MN and Ron Omann, Energy Coordinator, of USDA’s Rural Development in St. Paul, MN to gather details about the REAP program, and understand how potential applicants might prepare their projects to ensure their best chance for project funding under this competitive program. Ms. Rose noted that with costs of solar technology steadily decreasing, applications including solar technology are becoming more appealing to the REAP program officials. Based on past experience, Ms. Rose believes that renewable energy production, including solar, will continue to be a priority for REAP funding. Start the process early. Renewable energy projects take time to design and engineer, and specific information needed for the REAP application can only be gathered after these processes have taken place. For example, Mr. Omann suggests an energy audit and renewable energy assessment (or at least some detailed calculations indicating energy savings and payback for an energy efficiency / renewable energy project) be completed prior to preparing an application. Ms. Rose recommends at least a two-month lead time for putting together project plans and an application, and up to a year of prep time for the largest of projects. Keep your cart behind your horse. Ms. Rose stressed the fact that in order to be eligible for funding, an applicant’s renewable energy project cannot have purchased equipment or started construction before the grant application is received by the USDA. However, once USDA receipt is confirmed, a project may begin construction. USDA is currently accepting applications for FY 2013 REAP projects, though no definite application deadlines or funding dates have been released at this point in time. More on REAP: REAP can be a great tool to help make your solar project a reality. With a bit of careful planning, you can ensure a strong application to increase your chances of receiving project funding under this competitive program. Click here for more information on REAP in Minnesota. You can also find the nearest USDA Rural Development office to your farm or business that can assist you with the REAP application process. Grant Writing: For grant writing assistance, contact Kellye Rose and others who are listed as grant writing resources by the USDA Rural Development office. Click here to obtain a listing of all grant writers’ contact information.